Gizmodo is reporting a new Star Wars game for the Wii. Now you get to use the Wii-mote as a Wii-Saber. Wow. This would be fun. I don't know why I'm posting this, but I am. And yes, ouch! Along time ago (1994) I listened to this band. This was really the only song that hit radios. I was a fan and bought several CDs. The problem was, they produced one that had a bunch of dirty language. I wrote a letter to them and stopped being a fan. This song is still cool and inspired Cyclops Boy and Summertime (my songs). Today was a “Big” Apple Inc. event where Steve Jobs announced new iPods. They all look really great. Here is the trouble this causes for me: Watching the keynote all the way through, I found out some troubling information. Steve lowered the price of the iPhone to $399.00 for the 8GB model (there is no more 4GB model). That’s $200.00 off the price. This makes the phone priced pretty well; after all, it is an 8GB iPod and cool functioning phone. And with the announcement of the iPod touch today, it’s only $100.00 more for the phone feature. Now I really want the phone. I want to sell my laptop for it. But I need a new home computer to replace it. An iMac would do the job. I think for the price I should be able to get for my laptop, I could get an iMac and iPhone. Yes, it's a really nice laptop. I've just become an Apple fan. I need GarageBand to start recording my music. So, iMac. 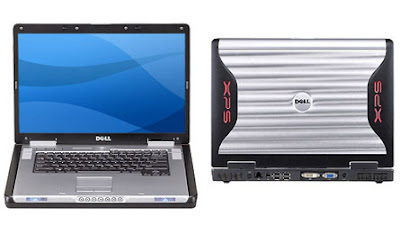 Here's my laptop offered at $1,600.00. This is $900.00 less than my previous asking price for it in this entry. It still has a Dell warranty until May 2008 too. Please help. Your purchase of this great laptop will help get this boy out of trouble. Check this out. Great video found on digg.com.